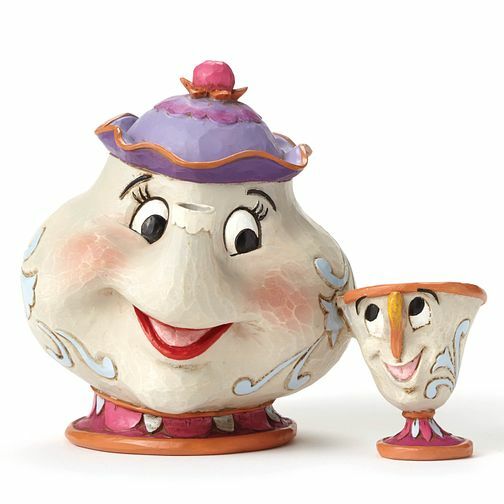 An endearing hand-painted figurine from the charming and colourful Disney Traditions range by Jim Shore, featuring Mrs Potts and Chip. A lovely addition to your own collection or treat for someone special. Disney Traditions Mrs Potts & Chip Figurine is rated 4.9 out of 5 by 21. Rated 5 out of 5 by Anonymous from Stunning Ornament! Bought this beautiful little collectable for a friend and she absolutely loved it. It's made to look hand carved and very well made! I'll be buying her more of this collection for sure!